This post is sponsored by Stella & Chewy's. 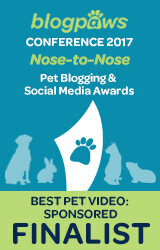 Pawsitively Pets only shares information we feel is relevant to our readers. All thoughts and opinions are our own. Do you feed your dog kibble, but would like to try adding some raw to their diet? 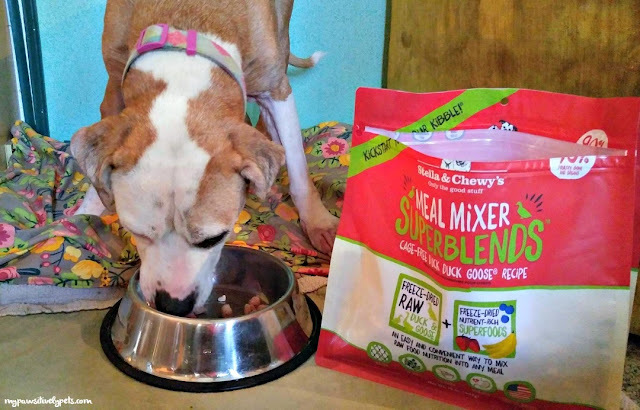 Stella & Chewy's makes it simple to add raw food to your dog's kibble diet with their Meal Mixers! Adding a scoop of Stella & Chewy's to your dog's daily kibble is all it takes to Kickstart Your Kibble. Meal Mixers are packed with wholesome raw ingredients that dogs crave like pure proteins and organic fruits and vegetables. Made with 95% meat, organs, and ground bone. Your dog will definitely thank you for adding Meal Mixers to their daily kibble. 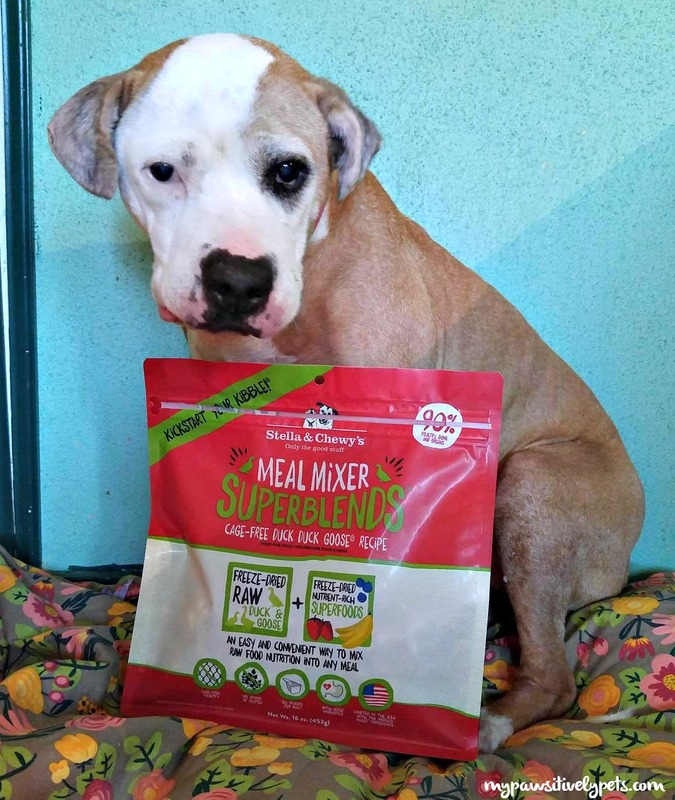 Also, now available from Stella & Chewy's are Meal Mixer SuperBlends. The New Stella & Chewy's Meal Mixer SuperBlends contain bits of freeze-dried antioxidant rich fruits like bananas, strawberries, and blueberries as well as 90% meat, bones, and organs. 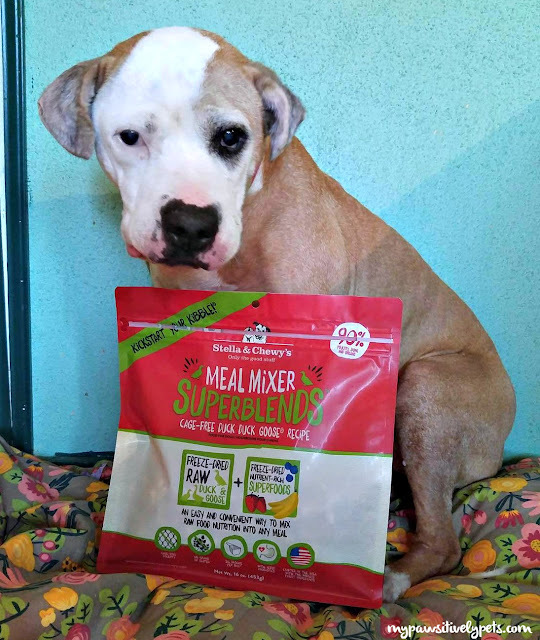 Shiner got her paws on some of the new Stella & Chewy's Meal Mixer SuperBlends and couldn't wait to dig in. Does your dog love Stella & Chewy Meal Mixers? Take the #MealMixerChallenge to win some awesome prizes! Post a photo or video of your dog trying Meal Mixers to Instagram or Stella & Chewy's Facebook page with the hashtag #MealMixerChallenge. 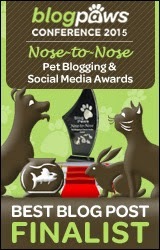 You could win $1000 worth of Meal Mixers, a PetChatz Pet Camera, and more. More details on the #MealMixerChallenge and how to enter HERE. 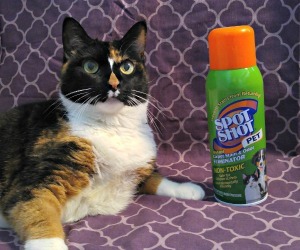 Of course, Shiner couldn't pass up on the fun of the #MealMixerChallenge and made her own video. While I do add Meal Mixers to her kibble when she eats it, it also makes a nice midday snack on its own. Don't have any Stella & Chewy's Meal Mixers at home? Grab a $3 OFF coupon HERE and pick some up to enter the #MealMixerChallenge. Check out the official contest rules HERE. I would love to introduce my dogs to a raw diet. Right now they eat Taste of the Wild kibble. Steel has a very sensitive stomach so we have to be really careful with him. Thanks for sharing!!! Now we need to grab us some and get in on the challenge!! Just make sure you introduce new foods slowly to your pets diet. We've seen our share of tummy upsets and other issues associated with changing a diet too quickly. Just add a little more of the new food each day and subtract the same amount of old food and the transition will be much easier on your dog's digestive system. Shiner seems to love it! We do like to add freeze dried raw toppers to the crew's kibble. We haven't tried this one yet, it sounds great!